There are currently three major manufacturers of cranial electrotherapy stimulation (CES) in the United States: 1).The CES Ultra; 2). EPI, Electromedical Products International; and 3). The Fisher-Wallace Stimulator. All fall under the regulation of the FDA (Food and Drug Administration). The FDA considers the products of all these manufacturers to be “substantially equivalent” to each other. The agency currently allows them to make claims for the treatment of anxiety, depression, and insomnia. Their products vary in price as do their electrical configuration. All are supported by a similar body of research evidence; though there is also a body of company sponsored research from Fisher Wallace and Electromedical Products International. The Meta-analysis of The Harvard School of Public Health is primarily based on the configuration in the CES Ultra. 90% of the independent research is based on that configuration as well. The CES Ultra is manufactured by Neuro-Fitness LLC and features a single 100HZ frequency, a modified square wave, 20% duty cycle. It employs conductive rubber earclips as well as pre-gelled electrodes. Current intensity varies between the units from the three manufacturers. The CES Ultra goes from 0-1.5 5milliamperes, experienced as a gentle tingling sensation. The Alpha-stim is in the micro-amperage range, making the sensation virtually distinguishable; though there is a sensation of light-headedness that often accompanies its use. The Fisher-Wallace has a range of 1-4 mA and, of the three units, the most clearly defined and perceptible stimulation. 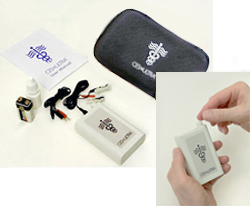 EPI, Electromedical Products International manufactures the Alpha-Stim M and the Alpha-Stim AID. The “AID” is their basic model and features a single frequency, 0.5HZ. The “M” has three different frequencies—0.5, 1.5, and 100HZ and in addition to the indications noted above, is also indicated for chronic, acute, and post-operative pain control. Both products have incorporated a waveform unique to EMP. The primary mode of transmission is earclips with moistened felt. The Fisher-Wallace Stimulator http://www.fisherwallace.com/ produces three biologically synchronous waveforms: 15,000 Hz, 15 Hz, and 500 Hz. The two slender electrical cables transmit current through either a small sponge that is moistened before use, or a self-adhesive patch. They are secured in place on the temples with a soft headband. Current flows between the two electrodes when the Fisher-Wallace Cranial Stimulator is turned on. In addition to the indications noted above, is also indicated for chronic, acute, and post-operative pain control. The alpha-stim AID and the Fisher Wallace devices are the most costly, followed by the CES Ultra as the least costly. This entry was posted in CES Ultra device and tagged alpha-stim, cesultra, cranial electro stimulator, cranial electrotherapy, manufacturer of cranial electrotheraphy stimulators in usa, no more sleep, sleep pills on February 6, 2014 by cesadmin.